This wine is made from Nero D'Avola (50%), grown at 50 metres above sea level on the Baroni Estate in Noto, and Merlot (50%), grown at 650 metres above sea level in the Pianetto Estate in S. Cristina Gela. 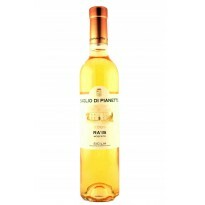 This wine is matured for 12 mounths in French Allier oak. Ruby colour, it is concentrated with pungent aromas of fruit and forest fruits followed by vanilla and spices. On the palate it is intense and has a very long length. Chief among the red wines produced in Pianetto, this structured wine, soft and balanced pays homage to the previous owner of the estate, the Baron Antonio Palizzolo of Ramione whose family began the cultivation of the vine in this location. The Ramione harmoniously expresses the different characteristics of the territories of the two estates, concentrating them in one essence.